The second season of Met at the Movies got off to an auspicious start yesterday, with Romeo et Juliette. I attended the show at Cineplex's Sheppard Grande in Toronto, in Theatre 5, a large and clean theatre with a huge screen, very comfortable chairs and good sound. Last season's technical glitches appears to be a thing of the past - the satellite transmission was flawless yesterday. Although I didn't ask the theatre manager for confirmation, I believe the four theatres were completely sold out. The audience typically was older - I didn't see any young people, which is a shame. I imagine the New Year's Day show of Hansel und Gretel will be a different story. It was very nice of Sheppard Grande to put on a wine-and-cheese tasting before the show, featuring cheese trays and very nice Jackson Triggs Red and White wines. I really wasn't expecting this, so my compliments to the management! The event was organized to promote the expanded cafe menu. Unlike typical movie theatre offerings of hot dogs and pop corn, now patrons can also purchase such items as chicken or veggie wraps or delicious sushi from Bento Nouveau. The promotion certainly got me to make a purchase that normally I would not have. I was also impressed with how clean the theatre was, free of the usual sticky spilled pop on the floor. These and other improvements made for a very enjoyable Saturday afternoon at the movies. This performance of Romeo et Juliette starred Russian diva Anna Netrebko and French tenor Robert Alagna who replaced an ailing Rolando Villazon. While I was disappointed at Villazon's absence, Alagna proved to be a worthy replacement. Both took some time to warm up - Netrebko's opening aria had smudged coloratura, and Alagna sounded a little dry of voice. Near the end of Act 1, both were in fine form, particularly Netrebko whose gleaming voice was a pleasure. Her dark hued lirico-spinto sounded full and opulent, her irrepressible personality in full display. 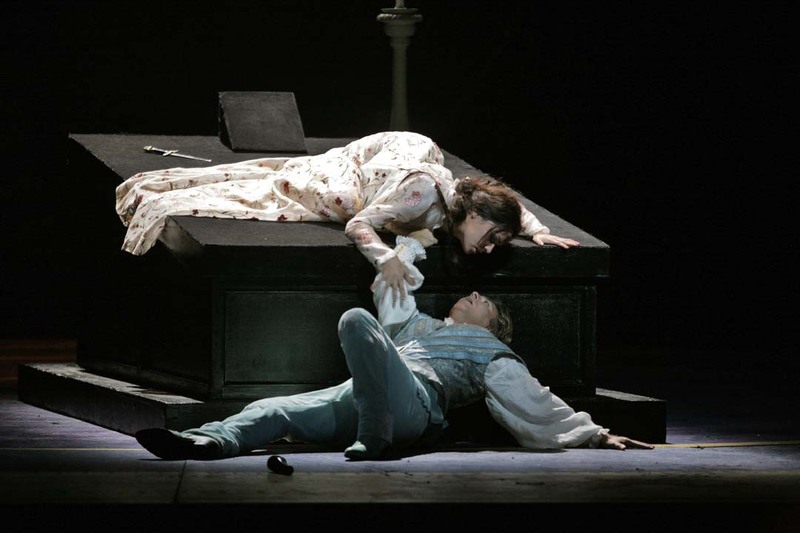 Romeo is a perfect vehicle for Alagna, who has sung this to great acclaim in the past. This afternoon, he was a suitably romantic and ardent Romeo. His "Ah leve-toi, soleil" was beautiful, perhaps just a bit too stentorian in his top notes while more chiaroscuro would have been preferable. The chemistry between the two was palpable - the "floating bed" scene was postively steamy, complete with "R-rated" body positions! It helps when you have two singers who also are such attractive people. The production by Guy Joosten was strong on Renaissance themes - projections of the sun and planets, the zodiacs, and a small black circle at the bottom of the sun projection that I assume was the "transit of venus". Given that Venus is the planet of love, this is an interesting symbolic touch. Placido Domingo frankly exceeded my expectations in the conducting department. In past performances I saw, his baton could be a little rigid and he wasn't responsive to the singers - like the Boheme last season, when he was booed. Yesterday, he was really quite masterful. No matter how you look at it, Domingo is a phenom. In the interview with Fleming, he said that he has sung 43 roles at the Met, and a career total of 125 roles, a phenomenal number. The supporting cast was generally strong. Bari-hunk Nathan Gunn did a star turn in the minor role of Mercutio, and Isabel Leonard was excellent as Stephano. Jane Bunnell, a Met regular, was a properly matronly Gertrude, while the celebrated British bass Robert Lloyd was a fatherly Friar Lawrence. The various fight scenes were realistically staged and stood up well to the camera. Indeed, the most impressive aspect of this show was the videography. The overhead shots and the backstage views were all stunning. I spoke to some friends and not everyone was happy with the intermission features and the behind the scenes cinema verite touches. Not me, I love it! If I were to nitpick, I think Renee Fleming tried a little too hard as the interviewer. All in all, this was a great show and it bodes well for the next seven telecasts this season. Well, we attended the "encore" performance at the cinemark18 in tarentum PA and there was apparently no signal for the first 25 minutes, so we missed the opening of the opera and then the sound and picture failed for a few seconds four times during the later parts of the opera. Very disappointing. I'm wondering if others at the "encore" had the same problems?